Japan’s only true world-ready adventure bike. Too focussed? For truly getting away from it all the Tenere, the latest in a long line of capable Yamaha adventure bikes to bear the name, really is a tool. For while many such motorcycles claim to be dual-purpose, selling the overland dream with rugged-looking rubber and the now de rigeur aluminium boxes, the Tenere really is adventure-ready, and certainly the closest Japan’s yet come to a mass-produced overlander. 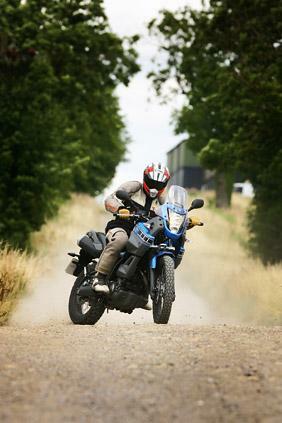 Based around the same tubular steel cradle frame and liquid-cooled single as the capable but uninspiring XT660R and XT660X, the Tenere adds rally bodywork, a lighter (and prettier) cast aluminium swingarm, a towing eye and a tidy pair of underseat exhausts to create a machine ready for the world’s wildernesses. The chassis, riding position and engine are pure dirt bike and, as a result, the Tenere is head and shoulders above its twin-cylinder opposition on the loose stuff. The suspension has the travel to cover rough roads at speed or pick its way through the really tough stuff, the engine’s soft, single-bang delivery finds traction where you really don’t expect it to and the fantastic riding position – high and forward over the front wheel – breeds mountains of confidence, as does the generous steering lock. Helping you out no end are the standard issue Michelin Sirac tyres which, on the Tenere, are one of life’s great bike/tyre combinations, up there with Pirelli Supercorsas on a Ducati 998 and Bridgestone’s control slick on Yamaha’s MotoGP M1. Great on tarmac, the Siracs manage to find grip on the most unlikely off-road surfaces too, from Lincolnshire mud to Saharan sand. Yamaha launched the Tenere in Morocco and, less than four months after trying to ride the same dunes on a BMW R1200GS and a Honda Transalp, the Yamaha was in a different league, ploughing through rutted sand and leaping off ridges like some kind of Dakar racer. 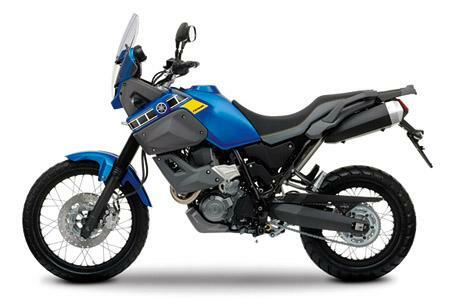 So that’s it then, the less-is-more Tenere is the perfect adventure bike. Kinda. Be honest, are you really planning to head off? Because if you’re going to commute or tour on your adventure bike for a few years first, building up to the day you tell the handbrake to get bent, the Yamaha’s worth avoiding. Because great though the Tenere may be as a dual-purpose land rover, as a dedicated road bike it’s not very good at all. Gutless, soulless, generously packed with vibration and blessed with a ‘powerband’ just 2000rpm wide, the 660cc single is not one of the world’s great engines. A bike that slows down up hills despite a wide open throttle is a novelty you can live without, believe me. The Tenere’s just not fast enough to be able to process A-road traffic like a motorcycle should, the engine forever revving hard and blitzing your pinkies with painful vibration while all the time the turbulent air rolling off the screen buffets your head like an endless stream of mackerel. A great bike then, but only if you’re going to live the dream, not play at it. 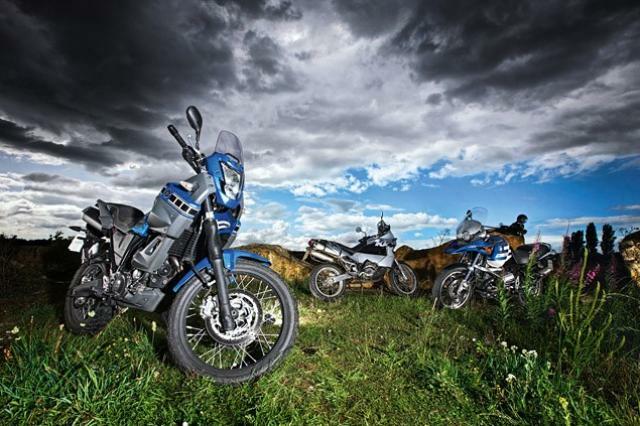 Introduced last year, the current Tenere has been a low-key model for Yamaha UK. Built in low production volumes, the bike is a niche product and the availability of secondhand bikes reflects this, with very few for sale. £4600 buys you an immaculate low-mileage example. 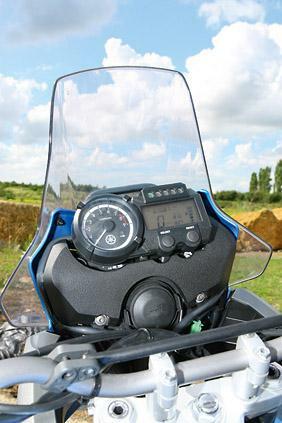 Screen: The Tenere’s standard screen is fantastically poor, generating serious buffeting for any rider, regardless of height. Metal Mule (www.metalmule.com) offer a taller flip screen for £49. Luggage: Yamaha’s aluminium side cases are pretty and more affordable than the aftermarket’s at £513 a pair plus £114 for the necessary rack. Yamaha also offer a top case at £263. Inner bags for the panniers are £27 each and £37 for the top case. Metal Mule offer aluminium cases in either an anodised finish for £1175 a pair, including rack, or powder-coated for £1253. Armour: Yamaha’s hard parts include a skidplate (£99), engine guards (£99), handguards (£92) and hand deflectors (which sit on top of the handguards for increased wind protection) for £50. Yamaha’s headlight protector costs £52. Metal Mule also offer a headlight cover (£25), a radiator cover (£39), replacement dogbones to lower the bike (£20), heel plates (£22), a rear reservoir protector (£25), a sidestand switch protector (£10) and a chain guard (£68). 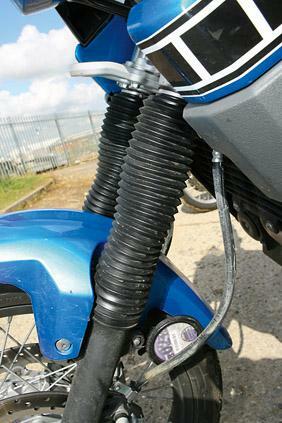 Exhaust: The Yamaha-approved Akrapovic slip-on exhausts cost £513. While it’d be pretty hard to damage a Tenere’s fuel tank beyond economic repair, if you do the cost of a replacement is a barely believable £1343. A replacement mirror is a much more modest £27 and the panels each side of the tank £28. The fuel injection on the XT engine has come in for some stick but the XT660R and XT660X supermoto tend to suffer with this more, particularly early bikes. Single-cylinder engines tend to be pretty immediate in their throttle response anyway, but the XT lump can jerk badly winding the throttle on in the lower gears.